Pets, Just like humans can easily suffer allergic reactions to certain products, especially with skin complaints such as Dermatitis. Even if you regularly wash your pet, the pet shampoo you use could actually help cause the problem. 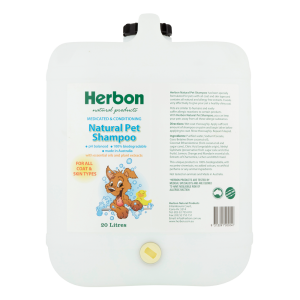 Herbon natural pet shampoo is not only developed and produced here in Australia, it is also the only product of its type on the market. It works very effectively to give your pet a healthy shiny coat without any nasty side-effects.